Lots of Apple users, especially iOS are used to back up their data, especially important text messages to iTunes or iCloud so that they can get them back whenever an issue comes up. There are different ways through which you can extract your messages from iPhone backup. You can get messages back by restoring iCloud and iTunes backup to your iOS devices and you can also use a reliable third party software to get your job done. 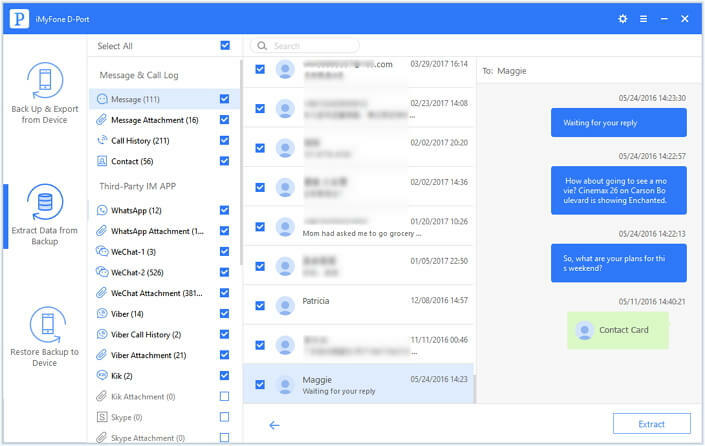 Here, we are going to tell you about the reliable third party software that is iMyFone D-Port and will also guide you on how to extract your messages from iPhone backup using this software. 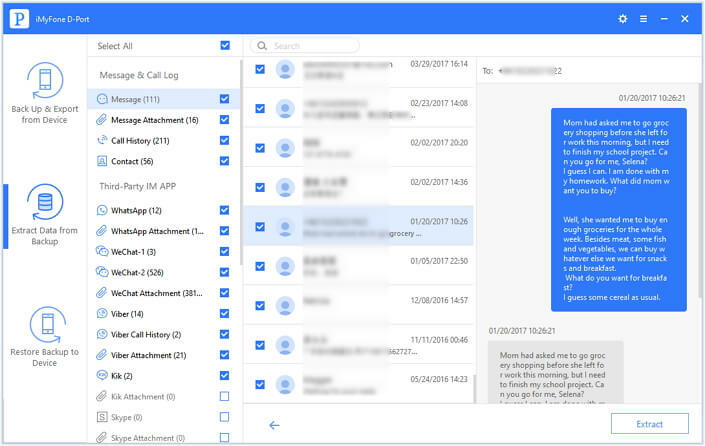 iMyFone D-Port iPhone Backup Extractor is the most trustworthy software through which you can export your messages instantly, safely and efficiently from iPhone backup. The software has all the expertise of extract your multiple data in their original formats. 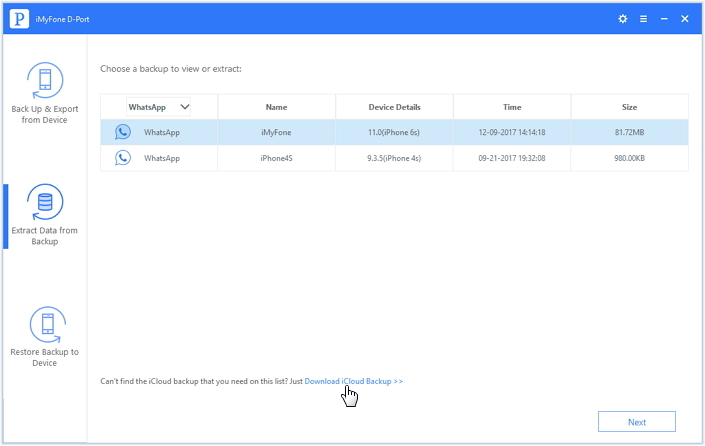 Support to extract data from iTunes backup, such as Messages, WhatsApp data, WeChat data, notes, voice memo, photos, etc. Download iCloud backup without restoring it to iOS devices. Released by reliable iMyFone company which developed famous iMyFone D-Back and iMyFone Umate Pro. Users can enjoy free trial version and 30-day money back guarantee. Step 1. The first step which you have to do is to download and install the iMyFone D-Port on your computer. Open the program next in order to start the extraction process. After the program loads up, click on "Extract Data from Backup" and select an iTunes backup file to extract messages from and click Next. Step 2. 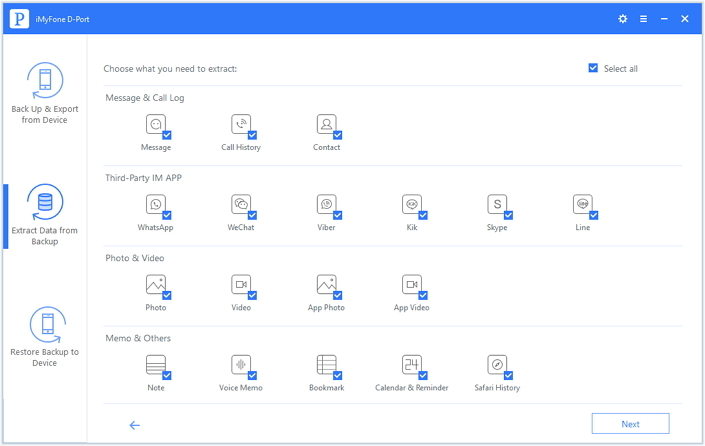 On the next screen, select "Messages" and click the "Next" button to start scanning the file.. You can also select all the data types from here to extract more data from iTunes backup. Step 3. After completing the scanning process, all of your messages in iTunes backup will be displayed on the interface. As the program is equipped with Preview function so select those messages which you want to extract. Now click on the "Extract" button to start extracting your messages. Also, select the destination folder to save your messages in your chosen folder. Step 1. Open the iMyFone D-Port on your computer. Click on "Extract Data from Backup".Choose an iCloud backup you want. If there is no iCloud backup you need, please click "Download iCloud Backup" to download it from iCloud. And login your iCloud acount to let the software get access to the iCloud backup file. And then choose the iCloud backup which includes the messages you need. Step 2. On this screen, all data types on iCloud backup are listed, select "Messages" from the data types from the data types. Step 3. Click next to download the iCloud file. Now all of your messages are on your screen. Choose those messages which you want to extract and click the "Extract" button. After that, choose the destination folder to save your extracted messages. Note: iMyFone will never keep records of any account information or content during the process. Always back up your messages to avoid losing all of your important messages. It's imperative that you only use reliable third party software to get your data because while there are a number of software tools which promise full extraction, only a few ever deliver what they promise. iMyFone D-Port iPhone Data Exporter is a reliable software equipped with all the functions which can make extracting messages from any iTunes or iCloud backup pretty easy!